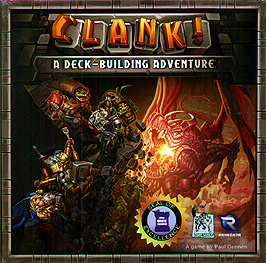 Burgle your way to victory in Clank!, the deck-building game. Sneak into Dragon Keep to steal precious artifacts. Delve deeper to find more valuable loot. Expand your deck, and watch your abilities grow. One false step and - Clank! Careless noise draws the dragon's attention, and each artifact stolen increases its rage. To enjoy your plunder you must escape the depths alive!